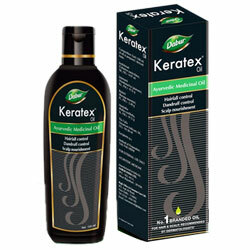 Dabur Keratex Oil - Hairfall Control, Dandruff Control, Scalp Nourishment - No. 1 Branded Oil for Hair & Scalp. Dabur - Hair Oils - Worldwide Shipping. Hairfall Control, Dandruff Control, Scalp Nourishment. Dabur Keratex Oil is Ayurvedic oil for scalp which is processed with Jyotishmati, Jatamansi, Brahmi, Manjistha and Tila Taila. All these ingredients are beneficial for the scalp. Effective massage with oil helps in sound sleep. Part hair and apply Dabur Keratex Oil on scalp. Massage gently. Apply preferably at bedtime. For better result use Dabur Keratex oil regularly or use as per Physician's advice. Most of the problems relating with hair loss are psychological rather than physical. Malkangani oil may help in these conditions. Jatamansi is beneficial for hair. It improves the blood supply to the skin/scalp. It has a cooling effect on the scalp and skin. It is useful in skin/scalp diseases. Brahmi has a soothing and cooling effect on the scalp. It is useful in skin diseases. Helps in improving blood circulation to the scalp after topical application and is useful in fighting the diseases of skin and scalp. As per Ayurveda, Tila Taila is considered best for massage on skin, scalp and hair. It nourishes the scalp as well as hair. It is also helpful in reducing headache. It helps maintain and improve hair colour.